San Juan Capistrano, CA, June 27, 2012—IQinVision (http://www.iqeye.com), market leader in high-performance HD megapixel IP cameras, today announced the introduction of the world’s first H.264 varifocal (3.6-6mm) mini dome series. Already one of the industry’s most cost-effective and popular mini form factor cameras, the Alliance-mini now offers field-of-view flexibility with the same industry-leading 5-year warranty. IQinVision has designed a unique, mini varifocal lens with a large objective lens element which significantly improves edge resolution while enabling larger field-of-view (FOV) and user flexibility. The ability to easily change camera position, FOV, and area of interest without switching lenses is a powerful new feature for the mini dome form factor. This development eradicates the need for integrators, installers, and end-users to purchase multiple backup lens options, saving time and money. These tiny cameras, which come standard with both beige and black trim rings for aesthetics and convenience, are designed for discreet indoor ceiling, surface, and wall mount installations ideal for education, retail, gaming, and healthcare applications. As with all the Alliance dome and 3 Series cameras, this newest series is backed by the industry’s best and only 5-year, all-inclusive warranty. ONVIF and PSIA compliant, these Main profile H.264 cameras offer exceptional image quality in vandal-resistant models from VGA to HD1080p resolutions. The true 3-axis gimbal, locking shroud and Power-over-Ethernet design saves time and money on installation and maintenance. The Alliance-mini also supports streaming audio, allowing 2-way communication between the camera and remote/ monitoring locations and the latest DTS capability. The Alliance-mini (IQD3xSV-B7) with varifocal lens will begin shipping in August. 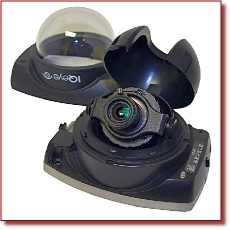 Additional options include a pendant mount accessory kit, wide and telephoto lenses.